Cancellation policy is 3 days prior to arrival. Late cancellation will incur 1st night at full charge. 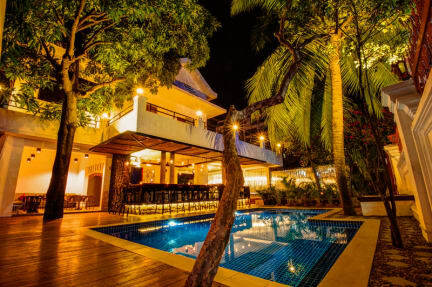 Base Villa is located centrally to all that Phnom Penh has to offer. To our North is the Central Market, the East is the Royal palace and if you head South you will find S21 and The Killing Fields. If you Love the night life we are within walking distance to Street 51 and a very quick tuk-tuk ride to the Riverside. Our products & services range from the bare necessities in accommodation with the creature comforts of a resort provided with a pool, bar and lounging areas that will create a relaxed atmosphere for the weary traveller. We have mixed and female dorms for those on a budget and private rooms with a balcony for those who want a little more privacy. The kitchen is fully functional and can cater for any occasion. Free Wi-Fi is provided to all room and common areas for those who are wired. 3. Cancellation poliy: At least a 3-day advance notice prior to the arrival date is required. 4. Our Reception is open for booking 24 hours 7 days a week. Please note if you require pick up from airport or bus station. Pick up from the airport will incur a one way $7 USD tuk-tuk fee.